BirdCagePortal.com - Pet Bird Supplies, Parrot Supplies, Cages & Bird Products - GB-16 - Lixit Glass Water Bottle Replacement - 16 oz. 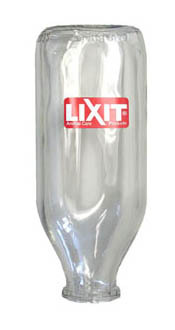 GB-16 - Lixit Glass Water Bottle Replacement - 16 oz. Lixit Corporation is the largest small animal watering device manfacturer in the world and provides excellent waterer products for birds. Water bottles are highly recommended because they are more sanitary and provide a clean, fresh source of water at all times. Bacteria counts in water bowls double every 3 hours. Unless you can change your bird's water and disinfect the bowl several times daily you should be providing water with a water bottle. Change water daily ... at maximum change every 48 hours. If you use vitamin-enhanced water change daily. Disinfect the parts in a household bleach solution (1 part bleach to 10 parts water) for several minutes. Use a bottle brush to clean interior. Rinse thoroughly before returning bottle to your bird.